This tree in Colorado Pondersoa pine is native to Colorado. It is found throughout the state in the Mountain and Plateau areas. Its distribution is principally down the Front Range from the Wyoming line to Trinidad, east to Mesa Verde, and north to the Uncomphagre plateau. Natural elevation range is 6000′ to 8500′. On north slopes, ponderosa is associated with Douglas-fir. In southern portions of state, it grows along with Gambel oak. 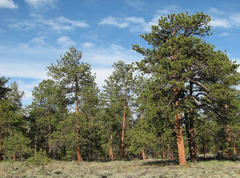 It is the most important commercial pine in the western US. It furnishes more wood products than any other pine. It will also grow in an urban setting. It is adaptable, but is intolerant of soils with high pH (alkalinity). As a young tree, it maintains its branches and looks very full. As it grows in height, the bottom and interior branches begin to “self prune” to give it a more open appearance. 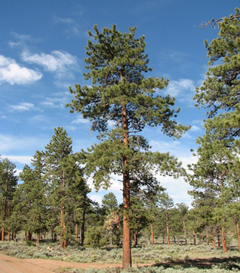 Ponderosa and Austrian pine often are confused. 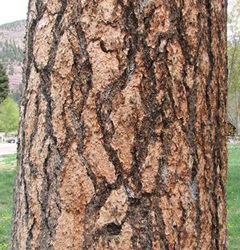 Austrian has a fuller appearance than ponderosa and maintains its lower branches. Hardiness Zones 2 to 8; frequently heat stressed in Zone 8. Growth rate Medium. After they are established, growth rate can reach 12″ to 18″ a year. They like open areas with full sun. They are not shade tolerant and they don’t like real moist soils. The best growing conditions are on dryer, well-drained locations. It can reach 75′ in 50-60 years. 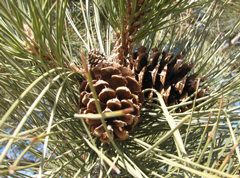 Foliage The needles of the ponderosa pine are in fascicles (bundles) of 3, sometimes 2. They are densely crowded on the small branches, rigid, yellow-green, 3-10″ long. Less sharp pointed than the Austrian pine. Leaves stay on branch for 3 to 6 years. Cones 3″ to 6″ long, on a very short stalk and reddish brown. Each scale is armed with a short sharp point as compared to the Austrian pine, which has no point. Bark Thickens as it ages. Deeply furrowed and platy looking when older and often cinnamon-red to orange color. As with many pines, the older bark exudes the sweet smell of vanilla. Younger bark is dark and scaly looking. 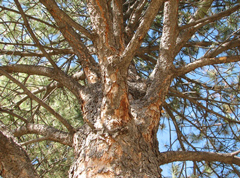 Insects and diseases There are many insects that like ponderosa pine. In natural areas, mountain pine beetle is threat. 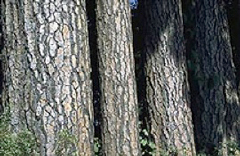 In urban sites, the pine engraver (Ips) beetle will attack the stressed trees. Pine tip moth also attacks trees in the 6′ to 10′ range.